In an earlier post, I discussed the San Francisco Giants’ vaunted home field advantage and came to the conclusion that, while a home field advantage exists, it’s not related to the Giants scoring more runs at home than on the road. That was done with about 90 games’ worth of data. In order to come up with a more robust measure of home field advantage, I grabbed game-by-game data for the national league from the first half of the 2011 season and crunched some numbers. Is there a statistically significant increase in winning probability while playing at home? Is that effect statistically distinct from any effect due to attendance? where is a binary variable for playing at home, Attendance is announced attendance at the game, and AttH is listed attendance only if the team is at home and 0 if the team is on the road. Thus, I expect so that a team on the road suffers from a larger crowd but a team at home reaps a larger benefit from a larger crowd. The linear probability model is easy to interpret, but not very rigorous and subject to some problems. As such, I’ll also run a Probit model of the same equation to avoid problems caused by the simplicity of the linear probability model. Since runs are a factor in winning, I have the same expectations about the signs of the beta values as above. So, my prediction about the attendance betas was incorrect, but only because I failed to account for the squared terms. The effect from home attendance increases as we approach full attendance; the effect from road attendance decreases at about the same rate. There’s still a net positive effect. Note that in both cases, there’s a statistically significant , meaning that teams are more likely to win at home, and that for large values of attendance, the Home effect outweighs the attendance effect entirely. That indicates that the attendance effect is probably spurious. 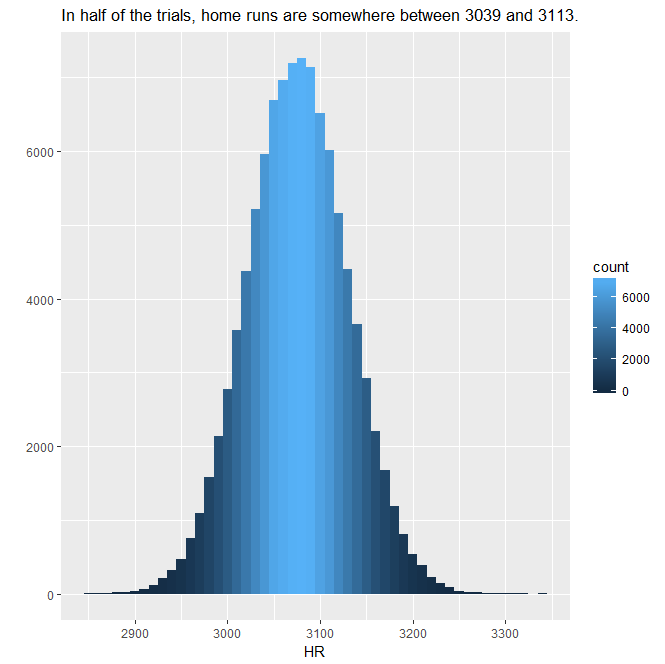 Again, with runs, there is a statistically significant effect from being at home, and a variety of possible attendance effects. For low attendance values, the Home effect is probably swamped by the negative attendance effect, but for high attendance games, the Home effect probably outweighs the attendance effect or the attendance effect becomes positive. Again, the Home effect is statistically significant no matter which model we use, so at least in the National League, there is a noticeable home field advantage. Mariano Rivera did something strange tonight: He plunked in the winning run. He hit Jeff Francoeur of the Texas Rangers to force in Nelson Cruz for the winning run in extra innings. It was his fourth hit batsman of the year and only his third loss. A walk-off beaning requires an extraordinary set of circumstances. First of all, like all walk-off plays, it requires the home team to be at bat in the bottom of the inning. In this case, it was in extra innings rather than the bottom of the 9th. It additionally requires a tied game in the bottom of said inning. Finally, it requires the bases to be loaded when the plunking occurs. That means that in 10,000 innings, we would expect that to occur about 4 times, assuming that Mariano wasn’t removed after having walked the bases (which would obviously introduce some bias). Oddly, the last walk-off hit by pitch also involved the Yankees, albeit on the other side, way back on July 19 of 2008. That night, the A’s’ Lenny DiNardo hit Jose Molina with a pitch to force in Derek Jeter, again in extra innings. David Robertson grabbed the win that night. It’s been quite a while since Alex Rodriguez hit Home Run #599 – nine days since July 22, but more quantifiably, 42 plate appearances. Just how much of a slump is he in? I’d like to propose a quantifiable answer: the Choke Index. Simply, we should assume that A-Rod’s failure to produce is merely the result of chance, and not due to choking or media distraction or even Rodriguez’s discomfort with the special chipped baseballs. (A better man than I would call this the Numbered Ball Effect.) Then, we should see how likely that is. At .055 home runs per plate appearance, the likelihood of going 42 plate appearances without a home run is or approximately .093. The Choke Index is simply or, in this case, .907. As it becomes progressively less likely that Rodriguez will go another plate appearance without hitting a home run, the Choke Index number rises. A theoretical Choke Index of 1 would indicate that the player’s lack of home run hitting is nearly impossible to describe by chance alone. A-Rod’s Choke Index between #499 and #500 was about .877. This is a man who doesn’t handle milestones well. Another example was Gary Sheffield in 2009, when he was attempting to hit his 500th home run. In the previous two years, he hit approximately .041 home runs per plate appearance. Much was made of Sheffield’s trouble hitting #500, but since he was hitting almost exclusively as a pinch hitter, he simply didn’t have many opportunities. Between his final plate appearance on September 26 of 2008 and his only plate appearance on April 17 of 2009, Sheffield went 21 plate appearances without hitting a homer. That gives him a choke index of .556. Barry Bonds, meanwhile, was hitting .065 home runs per plate appearance in the seasons prior to his record-breaking home run #756. #755 was hit in Bonds’ first plate appearance on August 4, 2007. Bonds made 3 more plate appearances, all walks, in that game. He hit #756 in his third plate appearance only three days later on August 7. He had August 5 off and made 4 plate appearances on August 6, meaning that Bonds went 9 plate appearances between home runs, giving him a choke index of .454. Rodriguez will hit his 600th home run eventually, but it’s getting painful to watch. Two of my favorite things about baseball happened during tonight’s game between the Yankees and the Indians. First of all, in the top of the ninth inning, corner infielder Andy Marte pitched for the Indians. Marte pitched a perfect ninth and coincidentally struck out Nick Swisher, who was brought in to pitch for the Yankees in a similar situation last year and struck out Gabe Kapler of the Tampa Bay Rays. I can’t promise it’s true, but I think that puts Swisher at the top of the list for involvement in position player pitcher strikeouts. Marte’s presence was necessary because the Indians used seven other pitchers. Starter Mitch Talbot went only two innings, and the Indians got another two out of Rafael Perez. Frank Hermann took the loss for the Indians during his 1 1/3 innings. Tony Sipp pitched another 1 1/3, and Joe Smith managed to give up four earned runs in 1/3 of an inning before being removed for Jess Todd for an inning. In the bottom of the 9th, Marte was all the Indians had left. Not to be outdone, Joe Girardi gave up his designated hitter by moving his DH – funnily enough, it was Swisher – into right field as part of a triple switch. Swisher moved to right field; Colin Curtis moved from right field to left field; Marcus Thames moved from left field to third base; finally, pitcher Chan Ho Park was put into the batting order in place of Alex Rodriguez, who came out of the game. Finally, A-Rod is up to 33 plate appearances without a home run. Assuming his standard rate of .064 home runs per plate appearance, the likelihood of this happening by chance is . I stand by my belief that there’s something other than chance (i.e. distraction or other mental factors) causing Rodriguez’s hitting to suffer. On Saturday, Daniel Nava hit a grand slam in his first at-bat (hitting ninth for Boston). Needless to say, the odds against this are exceedingly long. So far in 2010, there have been 1786 home runs hit in 73122 Major League Baseball plate appearances, for a rate of about .024 home runs per plate appearance. The American League has a league on-base percentage of .331 and the National League’s OBP is .329. That means that the prospect of any plate appearance ending in an out is (using .330 as the average OBP) .670. The likelihood of the bases being loaded at any point in an inning is the sum of three probabilities – three on base with 0, 1, or 2 outs. Note that this slightly overestimates the probability, since it ignores the likelihood of an extra-base hit. Obviously an extra-base hit would increase the chance that three people made it to base but one or more scored, leaving the bases unloaded. Now, with a home run probability of .024, and a bases loaded probability of .076, the (again, slightly overestimated) probability of a grand slam is about .002, or .2%. That is, about one in every 500 at-bats should be a grand slam. Since 1920, there have been only 10 people who have hit a home run and had 4 or more RBIs in their first game. The list is here. Of those games, six (including Nava’s) involved any player hitting a grand slam (including three hit by the rookie in his first game – Nava, Kevin Kouzmanoff on September 2, 2006, and Jeremy Hermida on August 31, 2005). Incredibly, both of them hit grand slams in their first career at-bats, with Kouzmanoff in the lineup as the DH in the #8 slot and Hermida pinch-hitting in the #9 spot. Also interesting is that Hector Luna played with both Kouzmanoff and Hermida when they hit their grand slams, and that in 2009, the Red Sox had no home runs with runners in scoring position by the #9 hitter. Quite a turnaround.